How I Gained It: I've struggled with my weight ever since I had my daughter 30 years ago. I'd gain, go on a strict diet and lose, then gain, lose, gain, lose ... It had just been a vicious cycle for me. I think the underlying problem, however, was emotional issues from a rocky childhood. Breaking Point: I realized how short life really is when my dad was diagnosed with pancreatic cancer. As I watched him waste away to nothing before the cancer took his life, I decided that I didn't want to die that way. The doctor told my siblings and me that pancreatic cancer could easily be inherited through genes. It just hit me that if I didn't want to die that way, I was going to have to change my way of living. 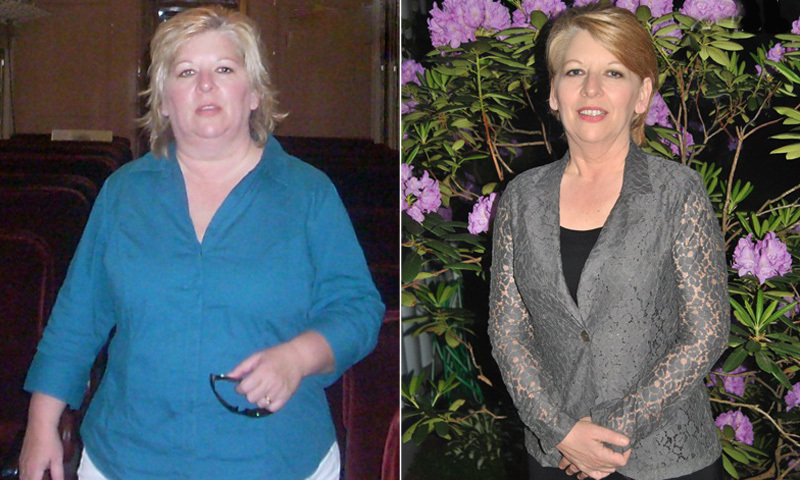 How I Lost It: At first, I cut out all sugar and consumed mostly protein, fruits and vegetables. I started an exercise program for myself that consisted of walking up six flights of very steep steps at my place of employment (a total of 88 steps) and walking for at least 30 minutes a day. When I first started this program, I could barely make it up the 88 steps one time without stopping halfway up to catch my breath. Now, I can run up and down the 88 steps ten times without stopping! I started jogging as opposed to the 30 minutes of walking. I changed my diet several times throughout this process because my body would get used to what and how I was eating, causing me to hit a plateau. I tried the 17-Day Diet and Weight Watchers. Along with changing my diet, I would increase my exercising in some way to help boost my metabolism. I still watch my diet, but am able to eat pretty much what I want as long as I get the proper amount of exercise. If I know that I'm not going to be able to exercise that day, I will cut back on the amount of calories I consume until I know that I will be exercising. There have been a few times that I've gained a few pounds, especially around holidays, but I know what I have to do to get back on track and I do it. You just can't allow yourself to make excuses or you'll be making them all the time and before you know it, you'll be back where you started!